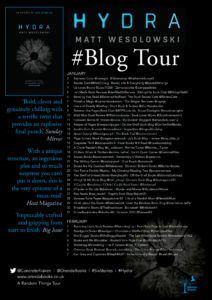 I’m one of those very few book bloggers who haven’t read Six Stories yet (although I do have it on my Kindle). So, whilst I knew there was a podcast style to the writing, I didn’t really know what to expect. In Hydra, Scott King, the journalist behind the Six Stories podcasts, looks into the infamous massacre in 2014 of the Macleod family (mother, father, younger daughter) by Arla Macleod, the elder daughter. In each of the six episodes he interviews a different person and gains a different perspective on what happened and why Arla did what she did. This is one creepy story. One of dangerous games and rituals, one of black-eyed kids, one of eerie events and mixed-up people. I made the mistake of reading it in bed at night and getting it into my head that the black-eyed kids were going to pop their scary faces round the door any minute. Whilst it didn’t give me nightmares, it definitely disturbed my dreams. It’s quite freaky in places and very dark. The story is plotted well as Scott learns more about Arla’s life and hears from people who knew her at various times, as well as the woman herself. As the whole thing unfolded it drew me in and I wanted to find out why. Why did this young woman kill the people closest to her? What were the circumstances that led up to the horrific events. I did struggle a bit with pretty much the whole book being in interview style, and the answers being like a conversation. I think it’s not a style that particularly suits me as a reader. But that doesn’t take away the fact that this is a clever, accomplished and unique book with a very current theme and I strongly suspect Wesolowski is an author to watch in the future. Matt Wesolowski is an author from Newcastle-Upon-Tyne in the UK. 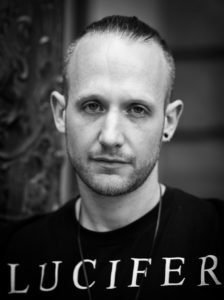 He is an English tutor and leads Cuckoo Young Writers creative writing workshops for young people in association with New Writing North. Matt started his writing career in horror and his short horror fiction has been published in Ethereal Tales magazine, Midnight Movie Creature Feature anthology, 22 More Quick Shivers anthology and many more. His debut novella The Black Land, a horror set on the Northumberland coast, was published in 2013. Matt was a winner of the Pitch Perfect competition at Bloody Scotland Crime Writing Festival in 2015, and his winning thriller, Six Stories, achieved massive critical acclaim, was a number-one bestseller in ebook, and was sold to Hollywood for a major motion picture. He is currently working on another installment in the Six Stories series. I had absolutely loved Six Stories, but I remember I was afraid the format would not be for me. I was surprised by how quickly I adjusted to it and I love the idea 🙂 But it’s true it can be a bit difficult and not everyone is appealed by it! I am happy you enjoyed the story nonetheless! 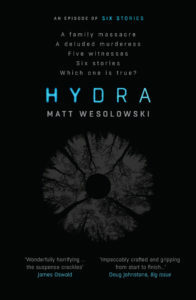 Haha, I knew what to expect so I read Hydra in full daylight! Great review! Thank you so much, Meggy. Well done for reading in daylight – I wish I had done that!